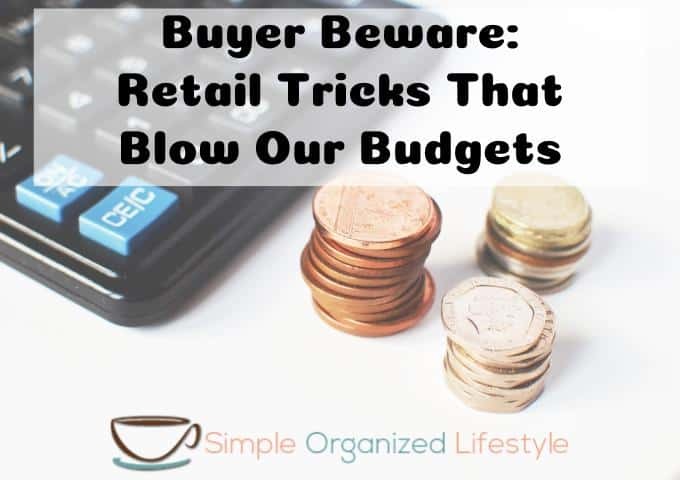 Buyer Beware: Retail tricks that blow our budgets abound, especially during the busiest shopping times of the year. Another Black Friday is behind us and guess what this love-a-great-deal gal did? I enjoyed a quiet day at home pulling out Christmas decorations and not getting out of my pajamas! Rosemarie at The Busy Budgeter recently wrote Top 10 Stupid Things that we Waste Money On. It’s a great article and one that I’m sure resonates with many of us. Three of the ten things she mentioned are fast food, cheap clothes and extended warranties. Those really struck a chord with me as three of many areas where retailers are counting on us spending our hard earned cash on Black Friday and EVERY day! Instead– skip the clothes buying for Christmas gifts. Unless it’s your kids and you know their exact style and size, most people are picky when it comes to their clothes. Black Friday is just as big for the fast food places as it is for the retail places. Any money saved from getting bargains through the day goes to food! Instead– grab some snacks for the car and purse and take coffee on your way. Set your food budget in advance and decide in advance on a place that won’t blow the budget. It drives me crazy to go through the spill about extended warranties at the check out. No, I don’t want the $7 plan on my $20 toaster oven! Most of the time, they are never used and my guess is that an appliance or electronic can probably be repaired for less than the warranty cost. I just see it as a gamble and upsell for more of your hard earned money. Instead- Read reviews on a product before making a purchase. Also, although I’m only a fan of using a credit card if you pay it off each month, they do offer some protection on purchases in addition to a store or manufacture warranty. Disclaimer… I totally get how Black Friday may not be so much for the deals as it is a tradition or fun time with friends and family. I just don’t want to see my friends and family blow their budgets on a day that is set up to draw people in like moths to a flame. Retailers are good at that every day, but especially at the busiest shopping times of the year! OMG those guys at the checkout offering warranties are so annoying. Poor guys have no choice in the matter I know, you can almost see the life draining from them as they have to ask it again. We also have several stores over here these days that insist on selling you their magazine or a bag for a pound when you know there are free ones under the counter. It would seem everything is becoming one big upsell these days!